NY-ICE speaks Truth vs Illegals Jericho Propaganda Walk (video) | the "silent" majority no more! On July 29, 2010, at 26 Federal Plaza, there was a hypocritical clergy-led “direct-action” by the New Sanctuary Movement, a Marxist quasi-religious organization that demands “President” Obama ‘ STOP THE DEPORTATIONS AND ENACT HUMANE AND JUST IMMIGRATION REFORM’. This was the FINAL Jericho Walk organized to promote their false narratives of “abuse” and “racism” along with bogus claims of ‘rights’ for illegals. They marched SEVEN times to raise awareness about about the United States’ deportation policy; marching ’round and ’round the Federal Building SEVEN times, as in the Walls of Jericho……get it? And then (they say) the WALLS of INJUSTICE shall come a-tumbeling and a-tumbeling, a-TUMBELING Down…. “The tiresome class warfare analogies share common attributes to other human prejudices: They are filled with stereotypes, play to the lowest human qualities and are equally intellectually vacuous. Joanna Marzullo, President of NY-ICE, countering the Jericho Walk. 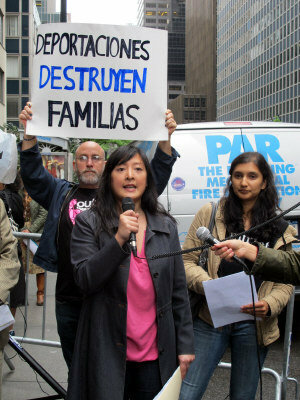 Michelle Fei is co-director of Immigrant Defense Project and graduated from NYU Law School in May 2003. She has Mandarin and Spanish skills. and Diana Mejía. An organizer with the American Friends Service Committee in Newark and co- founder of “Wind of the Spirit“, a group that champions “immigrant rights”. The man blowing the shofar was carrying two of the FILTHIEST flags I have ever seen (American and Israeli) and they looked like they’d been dragged through the filthy streets of New York . NY-ICE, LEGAL American Citizens all, challenged the lies of these propagandists as the Jericho Walk went round and round the Federal Building. One angry elderly Leftist was so upset by our facts, that he threw a bottle of water on NY-ICE President, Joanna Marzullo. And it seems, from the video, that New York Sanctuary co-Founder, Juan Carlos Ruiz, an inactive Catholic priest (in white shirt) … gave the old-man the ‘GO’ to fling the water…. PRETENDING TO BE PEACEFUL (and RELIGIOUS). In VIDEO ONE, the Jericho Walk passes by with lots of NY-ICE countering as well as the angry old man’s “water boy” moment…. After the march, there was a Press Conference. The Introductions were led by a fiery and predictably cocky, Patricia Malcolm, a Brooklyn minister. From her accented English, she seems to be Caribbean. Pastor Malcolm is, also, an activist who writes for HuffPo as well as secretary of CUSH (Churches United to Save and Heal), a coalition of 100 clergy members from NYC. The Time For A Just and Humane Immigration Policy is NOW! ” Passage of Arizona’s SB 1070 law is a call to action for immigrants and our allies across the nation. ” We need Comprehensive Immigration Reform! ” Stop the Deportation Now! ” Fight back and organize against on-going Racist Immigration Enforcement. The Reverend Bruce Southworth of The Community Church of New York Unitarian Universalist. He is active with a variety of interfaith and social justice organizations. These have included the Interfaith Coalition for Neighborhood-Police Partnerships (originally the Interfaith Coalition Against Police Brutality) for which he was a founding member and Co-Chair; the Forum of Concerned Religious Leaders, the NYC Workers’ Rights Board, Pride in the Pulpit, Vice President of PEARL (National Committee on Public Education and Religious Liberty) and membership on the Executive Committee of the Religious Action Network of the American Committee on Africa. To organize and empower the community for social change. To help immigrants and non-immigrants come to know each other and be enriched by one another. 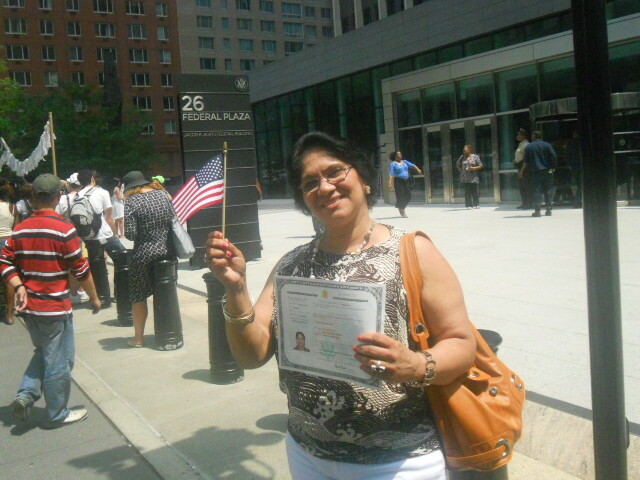 To educate members of the immigrant community on their rights and responsibilities. To promote activities to celebrate the rich cultural diversity of the Morristown Community. To advocate for the human rights and dignity of all people regardless of immigration status. To create a deeper understanding of the global conditions that underlie immigration. To work together for a world of solidarity, peace, and justice. Statement from: Yvette D. Clarke, US Congresswoman on Immigration. “As the daughter of Jamaican immigrants, I am acutely aware of our nation’s proud and unique immigrant history. Since its founding, our great nation has been a beacon of hope for those fleeing persecution and seeking opportunity. Nowhere is this legacy more evident than in Brooklyn. Our district is one of the most diverse districts in the country; full of immigrants from all over the world. This rich melting pot gives our neighborhoods their unique culture and is a source of pride for all who call Brooklyn home. Serrano was born in Mayagüez, Puerto Rico. At the age of seven, Serrano was taken by his family to The Bronx. Serrano went to high school and then attended Lehman College. He served in the United States Army medical corps from 1964 to 1966. Serrano was elected to the New York Assembly in 1974, where he served as chairman of the Consumer Affairs Committee and, subsequently, the Education Committee. Warren Joseph, a Trinidadian, who came to the U.S….. ILLEGALLY? ?….obtained his Green Card and chose to do the ultimate American act — join the Army. After returning from the war in Iraq, he suffered from post-traumatic stress disorder, ultimately being sent to immigration detention where he languished for 3 years and claims that he was “facing and observing numerous counts of abuse from immigration officials.” However he says in his own you tube video, that he was incarcerated for a crime. Below is Elder Will Eaton of Brooklyn getting ready to gesture towards NY-ICE. Near the end of Video Two is where he reveals how committed a RACIST he is while hiding behind the mask of ‘faith leader’. Nothing new, actually, since the ‘beloved’ racist-murder, the Rev. Al Sharpton, has lead by example…. Not one word of being PROUD to be Americans. OR Proud of America and the opportunities to succeed that brought them here (illegally). Just they have a RIGHT to remain here…. illegally. It’s all the usual Soc/Commie /Leftist Propaganda. La Raza, MeCHA. RACISTS organizations bent on destroying America by NOT building our future. And the politicians who spoke are supposedly sworn to uphold the laws of this country…our Constitution…. They should be removed for abuse of office. NY-ICE was there to THANK Arizona for defending our laws. For SB 1070. And so say to those illegals “ If you can’t respect our immigration laws, then go back to your OWN country.” Repatriate yourselves….GO HOME. There is no “RIGHT to REMAIN”. Not in My House! There is NOTHING racist about wanting to have OUR OWN immigration laws enforced *for a change*. Those who support ILLEGALS think it’s up to the Federal Government to enforce immigration laws, not the States. But the Federal Government has FAILED to do this and Arizona BEGGED the Feds to do enforce our laws before taking the matter into its own hands. The rest of the States should follow Arizona’s lead in this. Support Gov. Jan Brewer and SB 1070! God Bless America and KEEP HER STRONG. Great coverage, and fantastic photos! I’m glad you were there with us. I’m going to add this link to my original post at American Rattlesnake. Thanks so much, Gerard. Your post was great, too. Pingback: Why We Must Expose These SANCTUARY Movements | the “silent” majority no more! Pingback: JERICHO WALK 2018 FOR illegal RAVI RAGBIR – NO DEPORTATION | the "silent" majority no more!